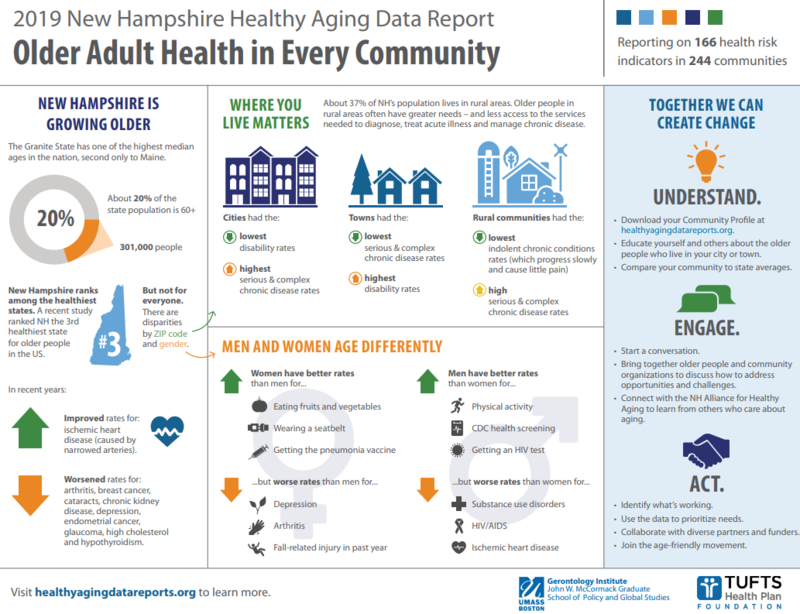 The New Hampshire Healthy Aging Data Report went online this morning (Tuesday, April 2, 2019). It was unveiled at a legislative breakfast at the State House and later in a conference call to journalists. You can see the website at healthyagingdatareports.org. People can look up their own city or town and find details about the older residents who live there: From what percentage have cancer, to how many have Alzheimer’s, to the number who have reported doing any kind of physical activity in the last month. The data report is also helpful in determining if your hometown is doing better or worse than the state average. AARP-NH volunteer Jim Isaak of Bedford helped explain the new website to legislators Tuesday, and he said the new service “gives you the option to identify where the opportunities are.” Isaak has personal experience with exploring the landscape for elderly services: His mother had Alzheimer’s Disease, and he sought help close to his hometown of Bedford. “Identifying and understanding the gaps in healthy aging will allow communities to continue to adapt, improving quality of life for all New Hampshire residents,” said lead researcher Elizabeth Dugan, Ph.D., an associate professor at the Gerontology Institute at the John W. McCormack Graduate School of Policy and Global Studies at the University of Massachusetts Boston. • Been used to convince Rhode Island legislators to provide discounted bus fare for seniors when gaps in public transportation were reviewed. • Helped justify adding $1 million to the budget for health programs in senior centers. • Resulted in expanded training and collaboration between mental health providers and aging service providers in Massachusetts. • Provided evidence of the need for memory cafes or other community changes to support people living with dementia in the Bay State. • Been used by the Massachusetts Department of Public Health to prioritize communities with high rates of asthma for a public education campaign. • Helped the Alzheimer’s Association of Massachusetts/New Hampshire make decisions about programming, policy, and services.